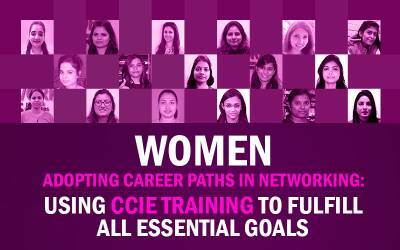 Why Network Bulls Is The Best Institute For CCIE Training In India? Networking is one of the most highest-paying fields in the IT industry plus it has the huge demand for certified professionals. This makes Networking a very an attractive career option for millions of fresher students, especially students from B-Tech, BCA & MCA graduation background. However, students from any graduation stream can go for Networking. Cisco Certifications are an integral part of networking career and choosing right Cisco training institute is critical for the success in networking. Cisco Certifications have 3 levels - CCNA (Associate level), CCNP (Professional level) & CCIE (Expert level). When you start searching for Cisco training institutes in India then many options would appear online; In real life as well, peers will suggest many institutes but which one is the best and you should go for? Search online or ask from friends, peers, one name will always top the list - Network Bulls. 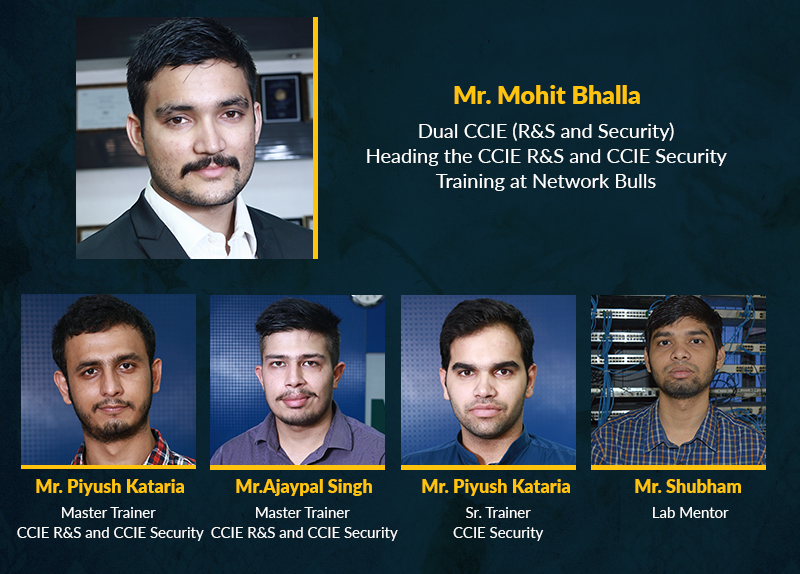 Network Bulls provides training on networking courses like CCNA R&S, CCNA Security, CCNA Data Center, CCNP R&S, CCNP Security, CCNP Data Center, CCIE R&S V5, CCIE Security V5 and CCIE Data Center certification. Apart from that Network Bulls also provides summer training, industrial training. But Why Network Bulls is Rates as No. 1 Cisco CCIE Training Institute in India? Let's explore the reasons. Network Bulls' CCIE Integrated courses are renowned for transforming a fresher student into a networking expert as these custom 100% job guarantee courses cover CCNA, CCNP & CCIE Certifications all in one. Yes, all 3 certifications in the same course. CCIE Integrated course training is delivered under intensive training methodology - World's most effective and innovative CCIE training model. In theoretical sessions, networking concepts are explained by CCIE Certified trainers on demo devices. 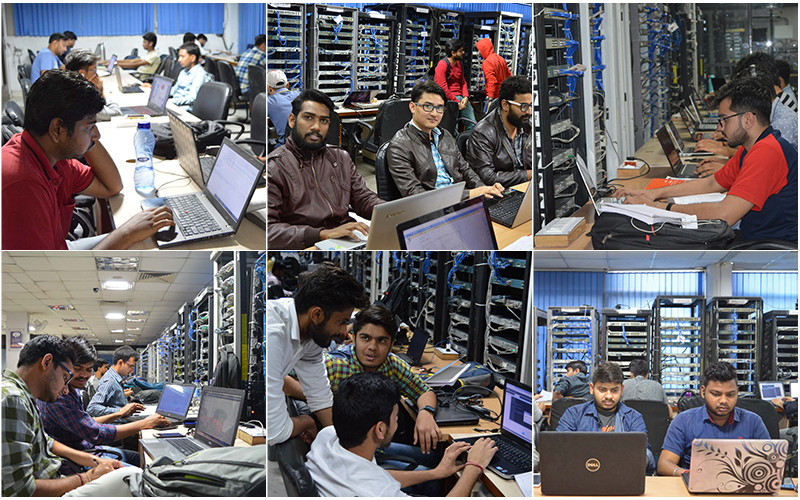 In practical sessions, students are taken to Network Bull's labs - also regarded as world's largest Cisco labs; here students practice the modules learned in the classes. 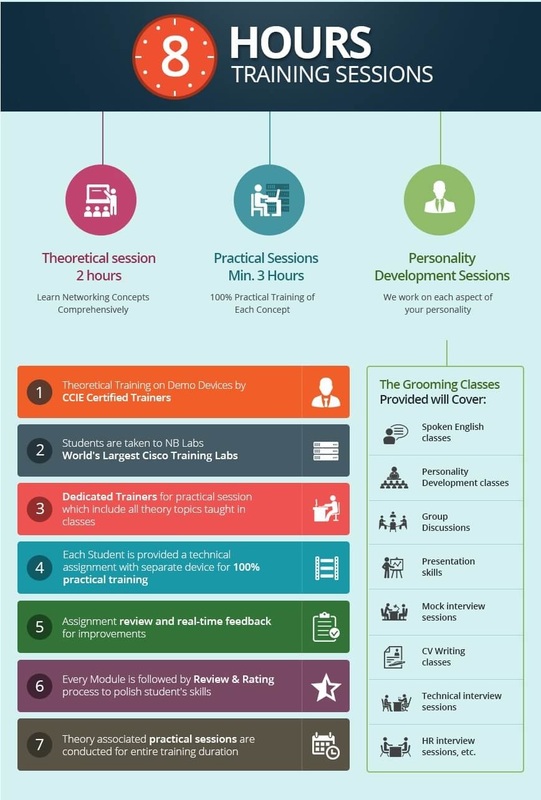 Personality development sessions include - Spoken English classes, Group Discussions, Presentation skills and confidence building classes, Mock interview sessions, CV Writing classes, Technical interview sessions, HR interview sessions, etc. Network Bulls has the world’s largest Cisco training labs that are fully loaded with the latest Cisco devices to ensure high-quality practical training of students. NB Lab has separate sections for CCNA, CCNP, and CCIE, training programs, unlike many other institutes. CCIE Labs have a separate setup, devices, and live racks according to the different tracks available where you can find CCIE Certified lab instructors all the time to help you in practicing the basic to advance level concepts of the specific track. Yes, Network Bulls' labs are open 24x7. You get time to practice on day or night, you can come anytime 7 days a week and practice at NB Labs. This facility is a blessing for students as well as working professionals who struggle with their schedule because of studies or office. The best part is, students will always be around practicing in our lab and lab instructors are also available for your help. And there is no limitation of how many hours, you want to practice. Practice as much as possible. Having best technical trainers is the utmost priority for an institute, thus at NB, you’ll find qualified CCIE certified mentors with 5 to 15 years of experience in the networking industry who will teach you about networking with proper guidance. Also, the technical team at NB is among the top five technical team in the world. 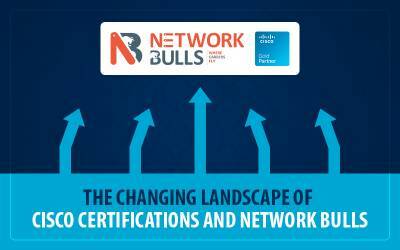 Triple, Dual CCIE Certified trainers have been part of Network Bulls training team since it's inception. Knowledge must reflect in terms of skills and that's where the practical understanding of networking concepts is very important. 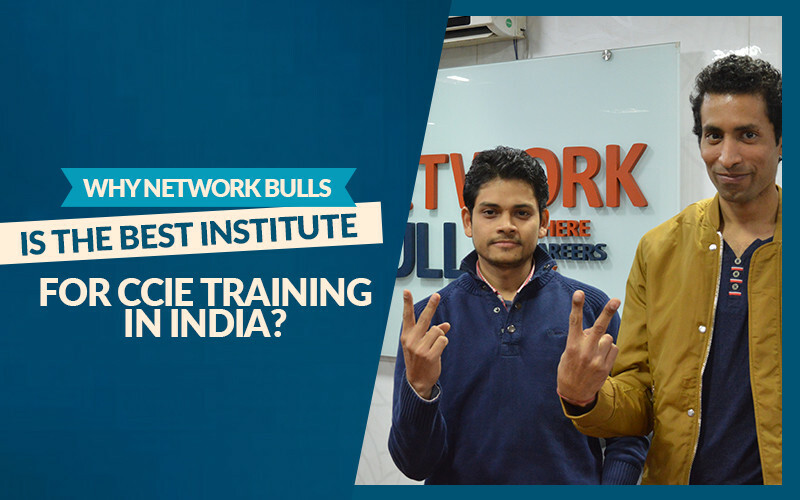 We at Network Bulls believe in 100% practical training and students are trained accordingly. NB's labs are fully equipped with real and latest Cisco devices as per different tracks and as per certification levels. NB provides updated practical workbooks with solved solutions for each of the Cisco certification available i.e. CCNA, CCNP or CCIE. The course content has been designed and drafted by Mr. Vikas Kumar (3XCCIE, #30078, Founder & MD Network Bulls). Workbooks include technical solutions and theory as per real life industrial set up and that is what companies seek for in certified professionals. As we mentioned earlier Network Bulls believes in imparting 100% practical training So, the labs at NB are updated and have separate sections for CCNA, CCNP & CCIE Level for practice. CCNA Labs have 1841, 2611xm, 2801, 2811, 2911, 3825 Series Routers | 2950, 2960, 3550 Series Cisco Switches | Cisco ASA Firewalls - 5510, 5512x, 5515x & More. CCNP Labs are equipped with Cisco Routers - 2801, 2811, 2911, 7204, 3825 etc. | Cisco Switches- 3550, 3560, 3750 etc. | ASA Firewalls - 5510, 5512x, 5515x | IPS - 4240, 4255 | ISE - 3315 & More. CCIE Labs are fully loaded with Live Racks & All necessary latest Cisco Devices for practical sessions. CCIE Labs have CCIE Routing & Switching Version 5 Certification Devices and CCIE Security Version 5 devices. To make sure our students get best of job opportunities after Cisco training, Network Bulls has a dedicated placement cell which organizes placement drives, job interviews for students. 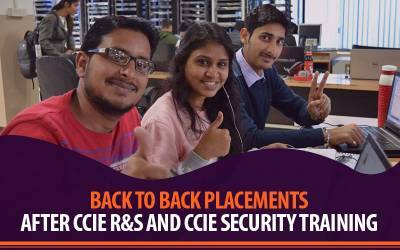 "Placement for each and every CCIE Integrated Student"
Keeping this motto in mind, NB's placement team works round the clock to get best job placement opportunities for students. Till date, 16,500+ students have been certified and happily placed by NB. 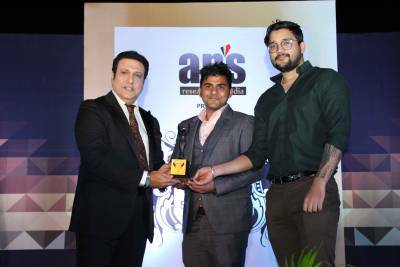 Placement team has done a major contribution to achieving this success. Want to know more about Network Bulls 100% Job Guarantee - Click here. 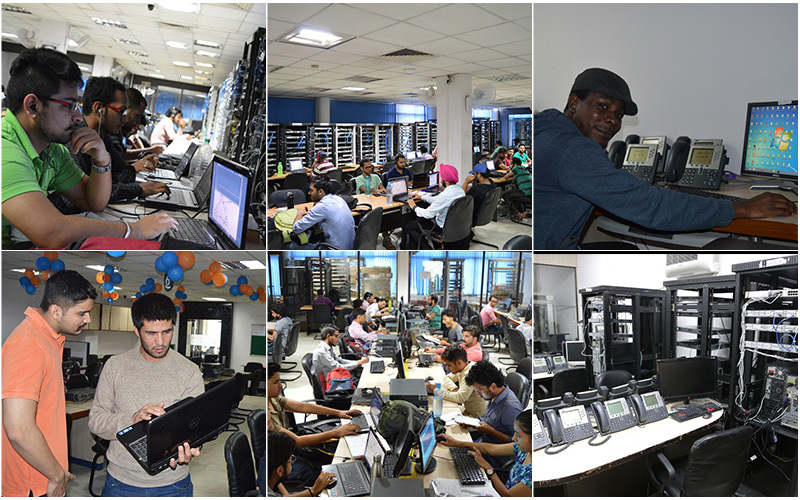 80% of our CCIE Integrated students get job placement even without clearing CCIE exams and before completion of the course. That indicates the effectiveness of this amazing customized CCIE Course. Don’t worry if you have missed any of your important classes because, at NB, multiple batches begin every week for CCNA, CCNP or CCIE. So you can join any batch to cover up lost sessions. Download PDF Why Network Bulls Is The Best Institute For CCIE Training In India? This is one of the unique facility provided by NB for students. This makes sure no module is missed and students learn each and everything comprehensively. Network Bulls offers job-oriented courses with 100% practical training and focuses on preparing candidates as per industry needs. Don’t get worried if you don’t have an IT background because, at NB, we have our own customized courses and innovative training methodologies to ensure everyone is employable. 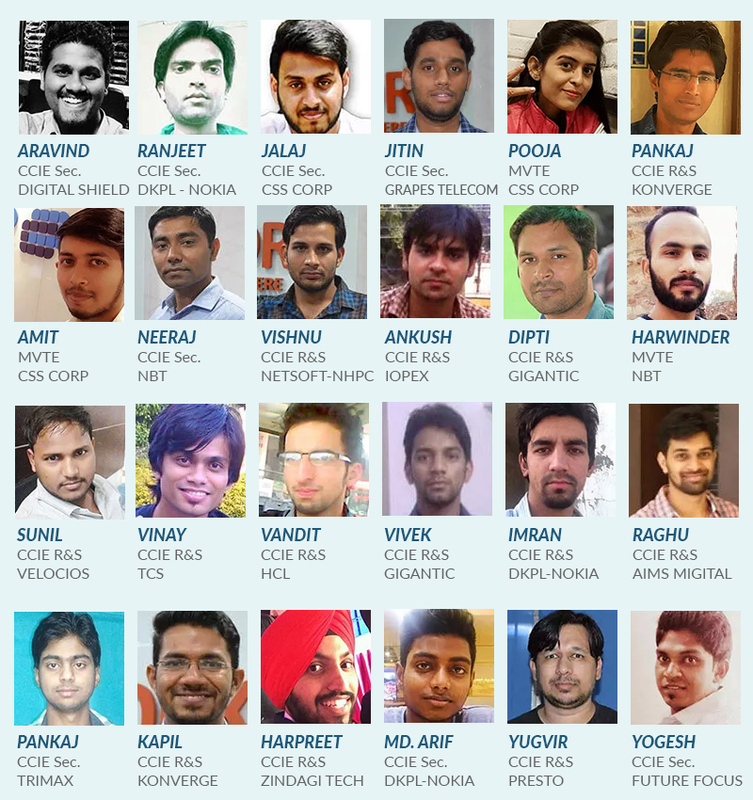 Till date, 16,500+ NB students have been placed successfully with some of the best known IT companies of the world includes- Cisco, Aricent, Orange, Accenture, Tech-Mahindra, HCL, TCS, Wipro, British-Telecom, Ericsson, and many more. Our students are not only placed in India but also in countries like USA, UK, UAE, Australia, Canada with handsome packages. Their salary packages vary from Rs. 5 to 14 LPA in India and Rs. 60 Lacs to Rs. 1.5 cr. Per annum abroad. Need more reasons to get convinced that Network Bulls is Best CCIE Training Institute in India?